Statements were filed in court on Wednesday. "I'm sorry for what I did. I didn't mean for this to happen. I didn't want to kill a cop. It went wrong and I'm sorry. I can't take it back." Pride has been charged with first-degree murder in the killing of Figoski on Dec. 12. Later that day, in an interview room with detectives, he gave a full statement of what happened. 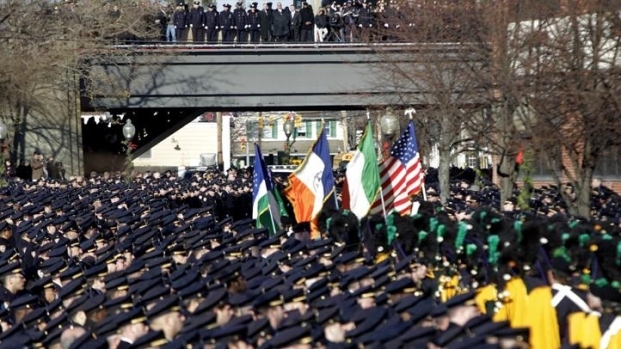 It was a sea of blue Monday as thousands and thousands of fellow NYPD officers came out to Long Island to pay their respects to the family of Det. Peter Figoski, who was gunned down last week in the line of duty. Greg Cergol reports. "I called my friend Nels, the number was in my phone to smoke some weed. He said he did not have any but he knows who has some. I got on the "A" train to 88th Street station. We met on 88th. we went to the weed spot. He knew the spot, a Spanish guy with a long straight poney tail let us in the basement door. I told Nels what I wanted, I gave Nels forty dollars, Nels walked to the rear of basement with the guy. I waited by the doorway near the boiler room, i heard a kick at the basement door so I stepped into the boiler room which was dark. The door kicked open, one guy rushed to the back wearing a dark brim hat low on his face with a greenish hoody, his right hand was in his sweatshirt pocket, a second guy walked in calmly, he started moving stuff as if looking for something. I hear police come the cops say get down, don't move. I see a cop in the center of the room, I tried to leave the boiler room and get out the door. The same time the second guy came out from the darkness of the basement looking to get out also. We both met at the door at the same time, he sees me and raises his right hand with a gun in his hand. I grabbed his wrist with one hand and the barrel with the other hand. I wrestled the gun from him. I tried to run out the door, he was still on me and pushed me off balance. I tried to get out the doorway. I fell down face first at the bottom of the steps. As I attempted to get up the gun went off. I got up and ran up the basement steps, jumped the fence and began to run. I saw a police officer in the street and he started chasing me. I ran down the street made a right on corner, then another right I threw the gun under a parked car. I began to walk when I reached the next corner, the cops stopped me. I don't know the names of the streets. I don't really come around this way. The cop said stop or I'll shoot. I stopped, laid down and the police brought me to the precinct in handcuffs. The gun was silver, it was big and heavy." Pride has pleaded not guilty. Four others who were with him were charged with second-degree murder and have also pleaded not guilty. Pride's attorney has not commented.